Orphaned as an infant, Sam is raised by a pharmaceutical research mission in the rain forests of Torundi. She wields a mean machete, makes soap from candlenuts and is a fairly astute amateur entomologist. You know, the normal stuff. But a month before her seventeenth birthday, she is exiled to an American boarding school in Malaysia. Armed with little more than her unusual upbringing and church-lady clothes, Sam must contend with her new existence as the world's most socially unprepared high school senior. Well that’s just fine. Because she is determined to solve the mystery behind her banishment and return home tout de suite. But when she discovers the unthinkable – that her banishment is tied to an enigmatic corporation with illicit designs on Torundi – she realizes the real mystery she must uncover is ... why? Soon, Sam is caught in a whirlwind of intrigue, danger and greed. As she chases this thread of truth to its end, she unravels a plot that threatens her beloved Torundi, her trust in the boy she has grown to love and her own existence. 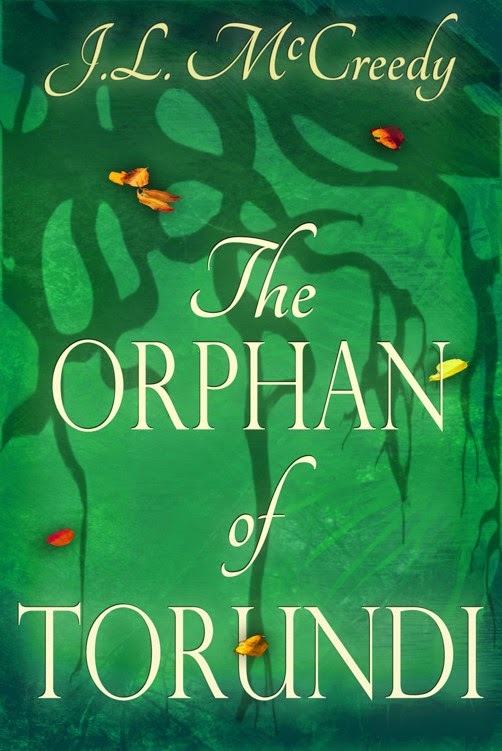 Blending espionage elements akin to The Bourne Identity with those high-school-awkward-moments (hey, it could happen), THE ORPHAN OF TORUNDI is a quirky, cross-cultural tale of adventure, suspense and romance. The Orphan of Torundi is the second book I've read by J.L. McCreedy and I loved it just as much as I loved her first book, Liberty Frey and the Witches of Hessen. As with Liberty I wasn't sure how to feel about this book when I first started reading it. I shouldn't have worried because it turned out to be so much more than I expected. It is not only an adventure but it's also a journey into growing up and learning just what it takes to find one's place in the world. Samuel (Sam) Clemens thought she had it all, orphaned and raised on the island of Torundi and had spent most of her life helping at the Mission where she was raised. She is shocked when suddenly she is sent away from the island to a boarding school. Angry, hurt, and confused Sam struggles to make sense of everything. Her search for the truth leads her into more than she ever imagined including: exotic locales, espionage, romance, and adventure all combining to make this story unforgettable. There is so much I want to say about this book. I loved the characters, especially Sam with her quirky humor and tenacity to find out the truth. I loved the locations and the beautiful imagery that pulled me into them creating a wonderful cross cultural experience. I loved the adventure and the mystery. The story was one that kept me turning the pages weather Sam was running down a clue or paddling downriver with her classmates. J.L. McCreedy did a great job balancing espionage and everyday life. It's not something that I'd normally look for in a book and I'm excited to have found it here. I also enjoyed reading Sam's reflections on how life can just move on around you. Her comments on how jarring it is to be thrust from one place to another really hit home and I found myself nodding in agreement with much that she said. I had no problem getting into this book and once I started I had a hard time putting it down. Anyone who enjoys mystery, romance, espionage, cross cultural experiences, and adventure would love this book. The Orphan of Torundi will make you laugh and cry and leave you breathless at the end wishing for more. Note: I received an electronic copy of this book from the author in exchange for my fair and honest review which I have stated above. You can find my review for J.L. McCreedy's other book Liberty Frey and the Witches of Hessen here.